"If The Lifestyle Don't Fit, Then Quit! Decisions Even Here In The Northern Forest!" Life is too short to not do what you love! My love, passion is still life here running dogs and enjoying the peace and serenity of the forest! 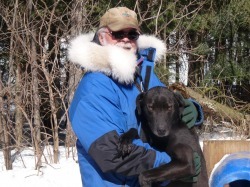 Yes even after 40+ years of Mushing, the enjoyment of the lifestyle here still intrigues me! The daily interaction with my canine family is a reason for living. Why after all these years, does the passion for Mushing still stures my soul? For me Mushing is not static. It is constantly changing and with these changes comes the challenges to adapt. I look on myself as a student. Always learning new ways of doing things to the betterment of my canine family. This type of lifestyle is not for everybody! It is all consuming, it is 24/7, 365 days a year. People ask: "Is it lonely living by yourself in the isolation of the forest without daily contact with humans?". My answer is that I am never alone, I have my dogs, the creatures of the forest and the inner peace of living with Nature. Every day is a new discovery. Mushing has changed a lot over the last 40 years and so has my development in interrelating to the dogs and the sport. The question is, is mushing an Art or a Science or a combination of both? Over the next few weeks, I would like to deal with this question through my own experiences and perspective. I invite you to join me on this journey.